Join us for the 2019 Capital City Figure Skating Competition! In partnership with the Nebraska Sports Council and the Cornhusker State Games, the 2019 Capital City Figure Skating Competition will be the official qualifier for the 2021 State Games of America. The top three medalists in each event will automatically qualify to register for and compete in the State Games of America regardless of the event type they medaled in. All registered athletes will receive passes to the Cornhusker State Games SportFest and Opening Ceremonies as well as be eligible to participate in the Parade of Athletes. Passes can be picked up at Breslow Ice Center the week of July 14. 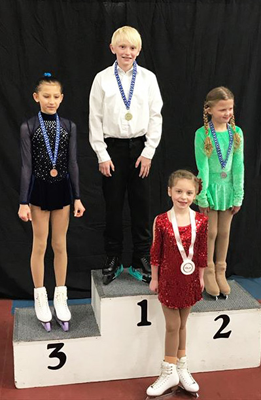 The top three places in each event will receive Cornhusker State Games medals and all registered skaters will receive a CSG t-shirt when they check in at the rink on the day of their performance.